Looks so yummy, right? It's fried pork chop prepared by my friend when I went and visit her last week. She cooked this one and here's her recipe if you want to know. In a large bowl combine all ingredients such as pork chops, garlic, ground black pepper and soy sauce. Mix well, cover and set in the fridge for 30 minutes or more. In a frying pan heat the oil and fry the pork chops for 5 minutes see to it that it's brown and cook well. Serve it with rice. That's a something for a heavy meal, I could devour a lot of it if I would want it. Nice post. It's my first to join the meme. yummy chicken adobo. This shot just made me want to to cook adobo for tomorrow evening. Nice post. Yumo! I could eat some right now. wow what a yummy pork chop partner with tomato and cucumber salad. that's yummylicious. wow! my 6-year old son, loved this much! So yummy!hmmmm. looks delicious sis! Pork Chop? Looks like rabbit. I haven't had rabbit in years. Numyum yummy! I love pork chops. Dip it in soy sauce, vinegar and sili = happy mouth and tummy! 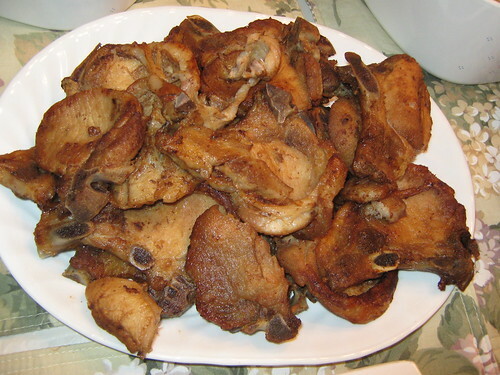 dae norms, nabusog jud ko nagtan-aw sa imong pork chop. very easy recipe.. mao diay ni ako luto-on for dinner unya:) thanks for sharing! Yum nga Norms. Pahingi nga.